The Belfast Marathon took place on Monday 7th May and two relay teams from AI took part to raise money for Action Mental Health. This year, a record number 17,000 entrants registered for the marathon, wheelchair race, team relay and fun run. After months of training, the running shoes were dusted off and the team shirts put on as our two relay teams prepared to run the 2018 Belfast Marathon. The day was bright but not too warm, perfect running conditions as Belfast paid host to an athletic effort on titanic proportions for the 37th annual marathon. The route covers the entirety of Belfast, from Ormeau in the south, to Sydenham in the east, and the Falls and Whitehouse in the west and north. It’s the perfect showcase of Belfast. 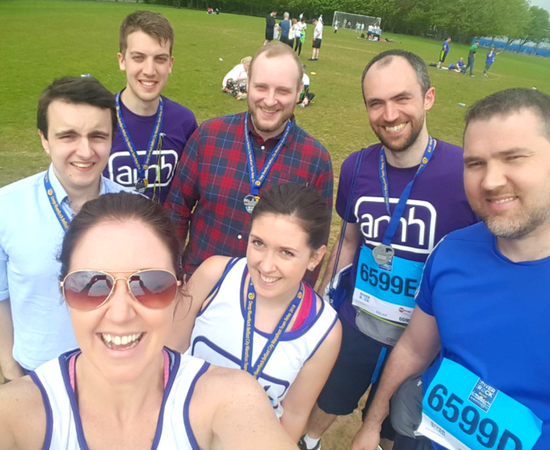 The year both relay teams, comprising of 10 of AI’s most enthusiastic runners, were running to raise money for our charity of the year: Action Mental Health. On the day a grand total of £2292 was raised, which has pushed us tantalisingly close to our annual goal. This total will then be kindly matched by Automated Intelligence, meaning that we can donate a fantastic amount to our chosen charity. The relay was a brilliant team effort and couldn’t have been achieved without the dedication and training of everyone involved. Some of the team loved running so much that they even decided to carry on past their own leg of the relay! Both Fergus McIlduff and Kyle Bingham ended up racing far beyond their relay leg. Speaking about the marathon, Kyle said, “I did the same third leg last year and wanted to push myself a bit further this time. I’ve been building up the distance of my training runs over the last few months as it would be a personal goal of mine to compete in a half marathon. My plan on the day was to do perhaps one additional leg (about the furthest distance I’ve trained for), but when I found out Fergus (who was running the same leg as me) was planning to go to the end I figured I’d set myself the same challenge. So, that wraps up another fantastic Belfast Marathon for Automated Intelligence. Best get started with training for next year then!